I've noticed in the movies of the 1970s, there were middle-aged actors holding revolvers with the other hand wrapped around the shooting hand's wrist. I looked up the actors, and most of them served in the military and even during World War Two. Was this used in real-life before isosceles and modified Weaver stance? It almost makes sense in a single action way. Semi auto for me is a 2 handed affair. No need to **** the hammer before every shot after the first on the 1911. 1st shot is double action (if you want) on most of my other semi auto pistols. I never need to re-position my hand unless I'm done shooting or need to reload. I believe modern handgun stance(s) goes back to the 50's and that (to me) would point to less informed (untrained) persons depicting gun play. I think actors do whatever they think looks good on camera, since they shoot only blanks. Think about the 80s when everyone on film was holding their guns sideways because Mel Gibson did it and it looked cool. Here's the walking, talking "Bible" on pistol shooting right now. Yes, it was used. As was the tea cup hold. Virtually all handgun shooting in the WWII era was one handed. There wasn’t any mainstream two handed pistol shooting until the 60’s. The wrist grab method was used in the 60’s and 70’s but it was never very popular. It doesn’t make ANY SENSE, whether for single action or double action, revolver or semi auto. There is NO reason to ever use the wrist grab method. The two handed technique really started in 1959 when it was used by Jack Weaver to win the 1959 Leatherslap match in Big Bear CA. Jeff Cooper eventually popularized it as the Weaver Stance. Still popular, it has been overtaken by the various versions of the Isosceles Stance. 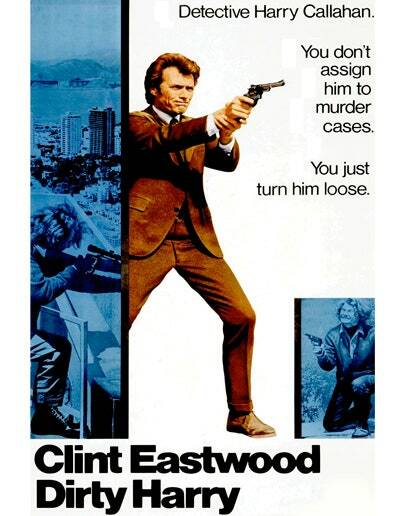 This poster for "Dirty Harry" is a good example. Been a long time since I saw anyone use this technique. Offhand I can't think of when it would be preferable to the Weaver, but, always good to think about alternatives. At least when you are firing an "ambidextrous" gat, it makes sense to do at least a little shooting strong hand only, and weak hand only. Maybe even weak hand Weaver. Because in a practical situation, one hand/arm may be disabled, or you may only be able to stay behind cover if you use your weak hand. Why do you still use the tea cup grip with the little guns?